Do you have a phrase that sort of lives in your back pocket and no matter where you are in your day or in your life, you think of it? For me, several phrases come to mind, but there is one in particular that’s been plastered to my heart with imaginary tape ever since my friend uttered it several years ago. Back then, another friend was quite down on his luck. His bills were piling up, his groceries were running low, and his spirit was crushed with worry. After some brainstorming, the idea of a basket filled items to help him out, fell into my lap. I started asking my friends and family to help me fill it and man, did they ever! By the time it was all said and done, his cabinets, refrigerator, and freezer were packed with food, his girls had been showered with gifts, and his faith was renewed. It was in the midst of that gathering when my friend changed my “giving” outlook, and quite honestly, changed my life. It doesn’t take a grand gesture to make a difference. 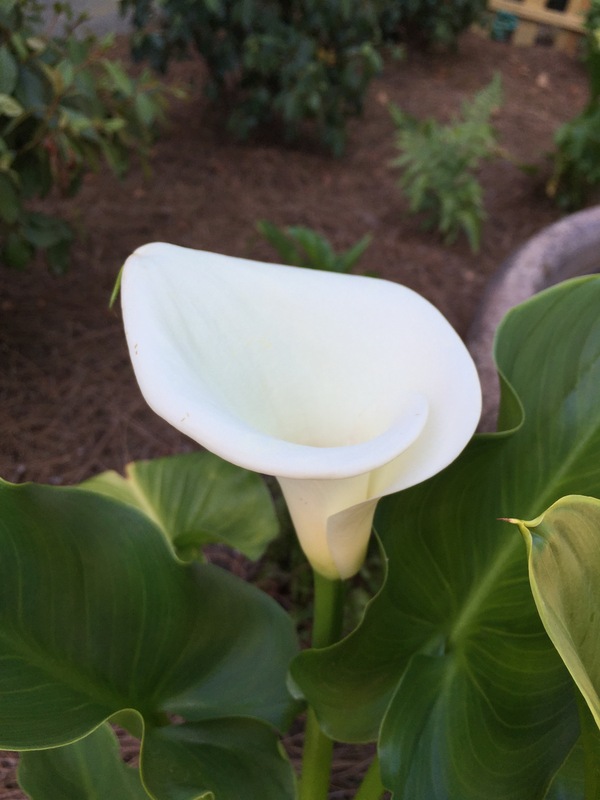 Beautiful words and a beautiful calla lily! That’s the way it should be in this country. I never give to charities, I give to people. The reward for such action is immediately received in the form of heartfelt smiles and even tears. Nothing in life is better than that. That way the most deserving get what they need without supporting the “leaches” that try to work the system. Yes, a lot of little gestures add up! Absolutely. And I think I usually get more out of helping than the recipients. Hi there! I’ve been stuck in writer’s block several days, then this fell out! :) This morning I told that friend that I wrote a story for her, she read it and said she is re-inspired! Can’t beat that! I can totally see why your friend feels reinspired. Isn’t it just the greatest to help someone out and to give them a gift? Ha ha, yes, writers block! :) I agree with you, giving is the BEST. Jessica, this is such a heart-warming story and your initiative and generosity is touching. 😀 So glad you and your friends could help and also show that kindness and humanity lives within us all. Stunning flower – perfectly formed. I just heard a sentence in yoga class last week that stayed with me, particularly because I’d been neglecting myself for a while, out of winter and job exhaustion (still raining here in Finland, waiting for the sun…)… Translated, it would go something like, “Your body is just hoping desperately that you’ll give it some attention, even just a little bit each day”. I actually started feeling bad for my own body! I instantly did a little beauty treatment at home, gave myself a much needed pedicure that I’d been putting off for at least a year. Ok now, I LOVE that!! I especially love that you heard it at yoga! I love yoga!! I’m so happy to hear that you spoiled yourself with a beauty treatment and pedicure!! What a heartwarming story – both how you and others pulled together the basket, and his appreciation and wise words. What a powerful share..I am sure it would have inspired all of your readers to be extra kind to the needy atleast for today :) Thanks for sharing this with us Jessica. Wonderful read..
kindness connects us Jessica of this i have no doubt! of course the pic of the lily omg beyond perfection but your story made my heart feel so full i swear it could burst! That is the sweetest thing to say. Like ever! Thank you so much! Thank you so much! Ooooh, have fun! your welcome and thanks! have a great day! I love this – such a wonderful thought to keep in mind!